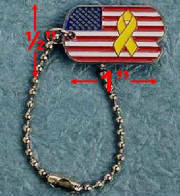 These are brand-new Patriotic Lapel Pins! 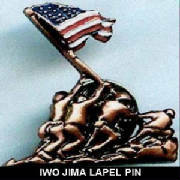 Choose from are "IWO JIMA"; "US Flag, Eagle and POW/MIA" and are "Support Your Troops" Lapel Pins! You can either buy all 3 in one set or purchase them separately. Buy them in larger quanities and save money! Sell them for profit! Each pin is in remembrance of our fallen heroes! Each Pin is Approximately 1 inch in Diameter! Buy them in Sets or Separately! Buy them in larger quantities and save!